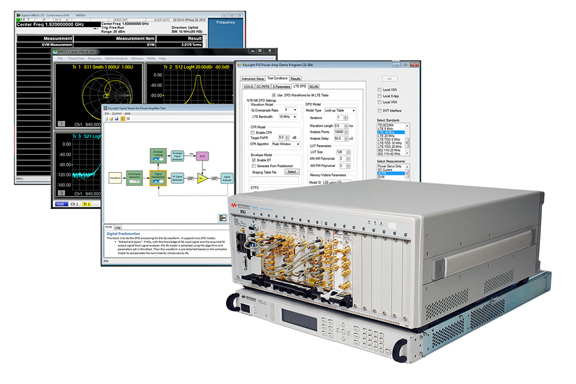 [SatNews] Keysight Technologies, Inc. has announced a new PXI Reference Solution for RF power amplifier (PA) characterization and test. The Reference Solution, which performs S-parameter, harmonic distortion, power and demodulation measurements, enables rapid, full characterization of next-generation power amplifier modules, such as a power amplifier-duplexer (PAD). The Reference Solution is optimized for high throughput and highly accurate measurement quality. It is the only small footprint, full characterization solution for design validation and product test of the RF power amplifier, as well as all of the passive devices surrounding the power amplifier, such as filters and duplexers. The robust digital pre-distortion (DPD) algorithms in the Reference Solution are built on years of close cooperation with wireless manufacturing customers and insights gained from Keysight’s SystemVue simulation and N7614B Signal Studio for Power Amplifier Test software applications. This makes it the only solution capable of providing consistent measurements, from simulation to manufacturing, for next-generation power amplifier modules. The proven DPD algorithms, with lookup table (LUT) and memory polynomial capability, complement the solution’s envelope tracking (ET) test capability. The solution includes fast waveform download, tight synchronization and automated calibration, critical for ET test. The Reference Solution supports multiple vendors, such as the Signadyne SD AOU-H3353 single-slot, high-speed PXIe AWG and enables the fastest envelope generation in the industry while reducing the test footprint. The new M937xA PXIe vector network analyzer and the M9393A PXIe performance VSA, enable the full characterization that customers need, including key high-density, high-speed S-parameter measurements and high-speed harmonics distortion testing up to 27GHz. The Reference Solution’s open source example code is optimized for PA characterization. Its design facilitates rapid evaluation of the test configuration and reduces time to first measurement. With these new capabilities, engineers can improve device performance with DPD and ET; decrease device size and cost amidst increasing device complexity and test requirements; integrate more capabilities in PAD-type devices; and reduce the size of test stations used to test multiple or complex devices. Keysight’s modular products and Reference Solutions benefit greatly from the company’s trusted measurement science and calibration routines. This allows customers to count on consistent measurement results, from R&D through production, and realize accelerated design cycle time. PADs are an increasingly popular alternative to more traditional power amplifier architecture because, along with lower power consumption and greater efficiency and value, they allow device designers to save and optimize space by replacing multiple, discrete components with a single, compact module. PADs are also rapidly gaining in popularity with device designers because of the trend toward increasing band counts due to the implementation of new LTE networks.